Electric vehicle makers are trying to tackle that EV battery safety issue with design, technology and rhetoric. You can see some good examples at the Detroit Auto Show this week, like Volvo, and Tesla. Long before Tesla’s Roadster, GM’s Volt or Nissan’s LEAF emerged on the market, the idea of stringing laptop batteries together to power a sports car, or smashing a battery-powered car in a high impact crash, generated a lot of discussion — and fear. But nowadays, the latest generation of electric vehicle makers talk a lot less about safety than I would have thought a couple of years ago. Today’s new EV manufacturers say they have largely kicked the safety problem. But also, the reality is that they’d prefer not to talk about what can happen if a rare so-called “thermal runaway” happens (lithium-ion batteries blow up) because they don’t want to scare potential owners in such a new market. At the same time, because the market is so new, there hasn’t been much opportunity for any horror stories yet ( Neil Young’s LincVolt fire not withstanding). But some auto makers are trying to tackle the safety EV battery issue with design, technology and rhetoric. You can see some good examples at the Detroit Auto Show this week. 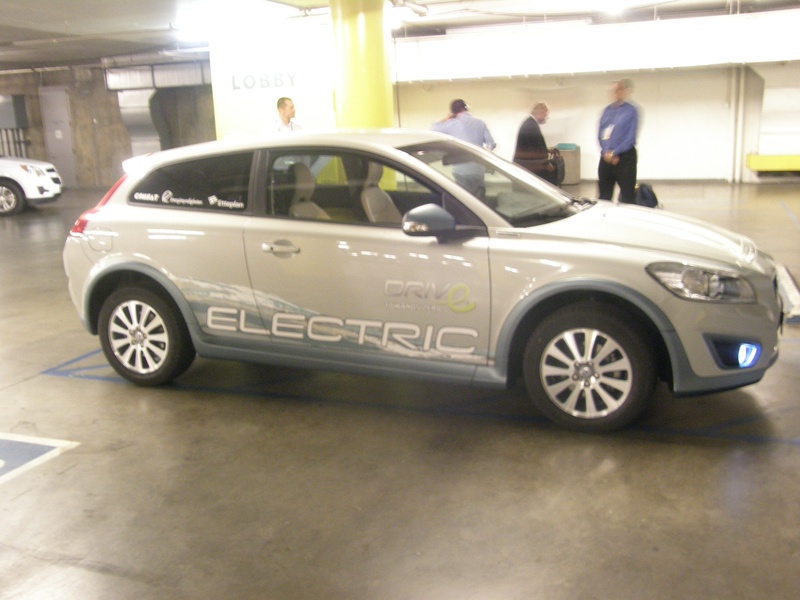 In particular, Volvo, given its reputation for safety, has spent a lot of time discussing EV safety, and at the show this week, Volvo CEO Stefan Jacoby showed off a crash-tested C30 Electric (see our test drive below) that used an Ener1 EnerDel battery. Volvo says this the first time a crash-tested EV has been displayed in public (shows you how new the industry is), and that the crashed C30 had a front collision, with a fully-charged battery, going 40 mph. The result, says Volvo, are that the batteries and electric system were still intact after the crash, and Jacoby said during a press conference that it is “vital to separate the batteries from the electric car’s crumple zones to make it as safe as a conventional car.” In Volvo’s C30, the batteries are split and one part is placed between the seats, and the other is under the rear seats (you can see in our video). Volvo says Ener1′s battery management system — which maintains s steady temperature — is top-notch, which helps prevent battery overheating problems, too. Of note, in the event of a crash, a crash sensor cuts power to the C30 in 50 milliseconds, similar to how an airbag works. Tesla is another EV maker that has been touting the safety features of its upcoming Model S EV sedan. In videos the car maker showed off last week, Tesla VP of Vehicle Engineering Peter Rawlinson points out an “advanced crumple zone,” a stronger body that can protect drivers in crashes, and a cooling system and a central heat exchanger that keeps the battery at a controlled temperature. The batteries for the Model S sit dispersed underneath the floor of the vehicle, which Tesla says makes the body of the Model S more rigid than most cars and as rigid as a high-end sports car. And unique to the Model S is that the batteries make the underside of the Model S completely flat and aerodynamic. In this case, design for safety delivers performance, too. Copyright 2011 GigaOM. All Rights Reserved.